We have recently created new brochure in PDF format for the latest new ramp from DEMAND – The Fusion. It can be downloaded from here – http://tinyurl.com/d8743c6 -. Briefly, the Boccia FUSION Ramp was recently introduced. The Fusion is the result of almost a decade of development and research in this field. This is our most comprehensive and professional Boccia Ramp. The Boccia FUSION incorporates a whole new swivel mechanism allowing the ramp section to be rotated whilst the base remains stationary offering the player a more precise level of control. Other features include leveling feet with angle and length adjustable legs to guarantee stable and precise operation of the product. 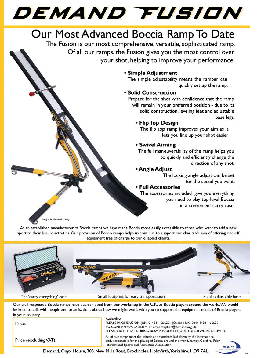 The FUSION also comes as a complete kit including two ramp extensions and head pointer all included in a custom made carry case for ease of transportation. Of all our ramps, The Fusion gives you the most control over your shot to help you improve your performance.